Roads – Go to MapQuest and enter a city to get a custom map of Ireland. Flags – Click on the map of Ireland to see each county’s flag. Travel – An excellent folding map by Michelin. 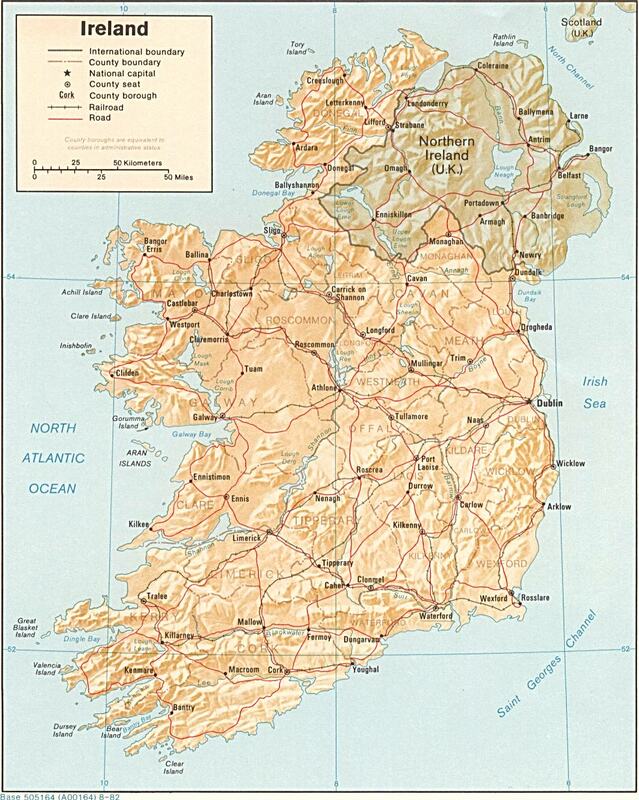 Ireland Atlas Wall Map – Richly detailed, this National Geographic print of Ireland shows country boundaries, parks, cities and towns, lakes, rivers, and highways. Ireland Political Wall Map – Exclusively developed by Maps.com and GRAPHI-OGRE and not available in any store, this wall map was created using high resolution vector digital imagery with state-of-the-art print on demand technology. This process allows Maps.com to offer over-sized laminated wall maps. Ideally suited for light reference, this political wall map includes cities, airports, rivers, lakes, and major roads (not numbered). Available in three sizes. 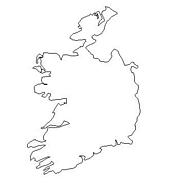 Click here for all Ireland map products – Maps.com! Fantasy Ireland Vacations: Experience the Emerald Isle of your dreams – With so many choices of Ireland vacations, how do you find YOUR fantasy Ireland? The Ireland you envision in your dreams? You deserve to experience the Emerald Isle YOUR way! Let us be your guide! Ireland’s location is in Western Europe, occupying five-sixths of the island of Ireland in the North Atlantic Ocean, west of Great Britain. It covers an area of 32,958 square miles, which is slightly larger than West Virginia. The land is mostly level to rolling interior plain surrounded by rugged hills and low mountains with sea cliffs on the west coast. The highest point is Carrauntoohil at 3416 feet above sea level. The climate is temperate maritime and modified by the North Atlantic Current. It has mild winters, cool summers, and is consistently humid. Celtic tribes settled on the island from 600-150 B.C. Invasions by Norsemen began in the late 8th century. English invasions began in the 12th century and set off more than seven centuries of Anglo-Irish struggle marked by fierce rebellions and harsh repressions. A failed 1916 Easter Monday Rebellion touched off several years of guerrilla warfare that in 1921 resulted in independence from the UK for 26 southern counties; six northern (Ulster) counties remained part of the United Kingdom. In 1948 Ireland withdrew from the British Commonwealth; it joined the European Community in 1973. Irish governments have sought the peaceful unification of Ireland and have cooperated with Britain against terrorist groups. A peace settlement for Northern Ireland, known as the Good Friday Agreement, was approved in 1998. Ireland’s population is 3,969,558 (2004 est.) with Celtic and English ethnic groups. 91.6% are Roman Catholic and 2.5% are Church of Ireland. English is the language generally used with Irish (Gaelic) spoken mainly in areas located along the western seaboard. Ireland is a small, trade-dependent economy with growth averaging 8% in 1995-2002. The global slowdown, especially in the information technology sector, pressed growth down to 2.1% in 2003. Agriculture, once the most important sector, is now dwarfed by industry and services. Industry accounts for 46% of GDP and about 80% of exports and employs 28% of the labor force. Industries are food products, brewing, textiles, chemicals, pharmaceuticals, machinery, transportation equipment, glass and crystal, and software.